I hear it all around me. There's a fizzle in the air, people calling greetings, reunion hugs, first meeting handshakes and mutual shoulder clapping for those readers expressing how nervous they are. A new to Flash Fiction Armagh person arrives in and I send her in the direction of the bunch mostly made up mostly from Women Aloud NI members who have all coalesced around one table. "Just tell them you're here by yourself and they'll welcome you," I say, but to be fair, such is our audience that you could sit down at any table and you'd be knee deep in conversation in two seconds flat. I see her safely absorbed into the craic before she even makes it to the table I'd pointed out. I give folk little more time to be social. The bistro staff are working flat-out to get everyone organised but luckily no-one is stamping feet and singing, "Why are we waiting?" We're in a happy place. I breathe a sigh of relief that we've filled the room and only need a couple of extra chairs brought in - a perfect crowd for a perfect night. Watching the room fill up before the event. Christopher Moore's story Solitude is superbly written and keeps us hooked right to the end. First time Flash Fictioner, Rachel Toner takes the floor and wows the audience with Inferno. No-one can believe this is Patricia Hanlon's first time reading her work, when she enthrals us with her extract from Kirty's Vow, leaving us all asking, "Where/when can we buy this book." Terry Hickland entertains us from his beautifully written forthcoming novel, The Piano Boat. We share in Maureen Boyle's heartache as she read her short story Box Room, and admire the sweater the story references her knitting. I bring us into the intermission with A Thick Foundation. After the break Réaltán Ní Leannáin expertly brings us through her excerpt from her novel set in Malta and written in Irish, Cití na gCártaí, cleverly bridging the language barrier so everyone can enjoy both the story and the language it is written in. Cathy Carson makes us all sit up and take notice with her amazing performance of Wake Up Call from memory - a new and higher setting of the bar in Flash Fiction Armagh! Mahogany is Peter Hollywood's thrilling story about a knife fight and keeps us all on the edge of our seats. Gaynor Kane gives us a wry smile as she recounts a strange decision by the Highway Patrol in Oregan in Jonah and the Whale. A stunning theatrical performance by Rose Tumilty of Hunter's Moon O'er Airgialla steps us back in history and lore. Eddie Mc Clenaghan's fresh take on a teched-up Santa brings the smiles to our faces with The Night Before Christmas Was Cool. Christmas Disaster by Doreen Mc Bride has us all laughing, ending the evening on a high was is still being discussed "up the town" on Saturday when I bump into audience members at the Georgian Festival. 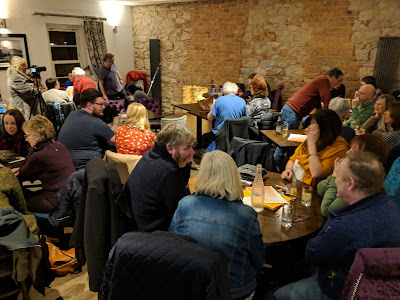 It's fair to say that the Flash Fiction events are going from strength to strength and that's due to the fabulous teamwork of the writers who submit such excellent work, the audience who support them and the wonderful venues we've been lucky enough to have host us. If watching these videos has given you some inspiration, submission's are open until 5th December 2018 for the Flash Fiction Saturday Night in the Museum taking place on 5th January 2019 in Armagh County Museum. So get those stories in asap!